Motorola Mobility, a subsidiary of Lenovo, has finally announced the names of smartphones that will be getting the Android 8.0 Oreo update. Officially launched last month, Android 8.0 brings a number of new features and improvements to the operating system. Various other companies including Sony and Nokia have already revealed their Oreo upgrade plans. According to Motorola, it plans to update all Moto Z-series, Moto G5-series and Moto X4 smartphones to Oreo. If you are wondering about specific models, I have listed the names of all Motorola phones set to get the Oreo update at the end of this report. Motorola added that the updates will be rolling out starting this fall (autumn). There is no word on smartphone-specific roll-out timetable at this point. To remind you, Android 8.0 Oreo is an incremental operating system update and doesn’t include massive user interface changes. On the Motorola phones, it will give you faster speeds, longer battery life, split-screen capabilities, smart text selection, improved notifications, and password autofill capabilities. Google Play Protect – another new great Android feature, which was announced alongside Oreo, has already reached all Android smartphones. 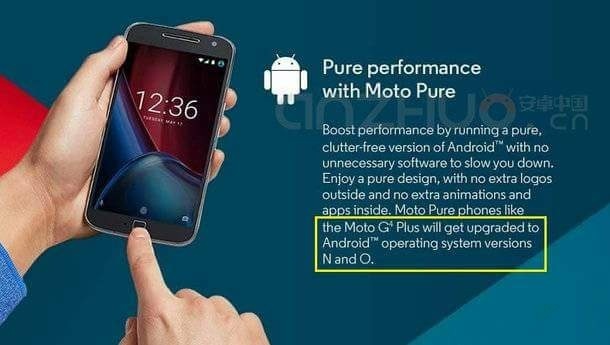 Motorola is showing its now cheap Chinese OEM purposely failed by lenovo , they promised in their Marketing presentation during launch that MOTO G4 PLUS would get UPDATE N and O.